Hobo-Geek: Pithos - The best Pandora client in Linux! 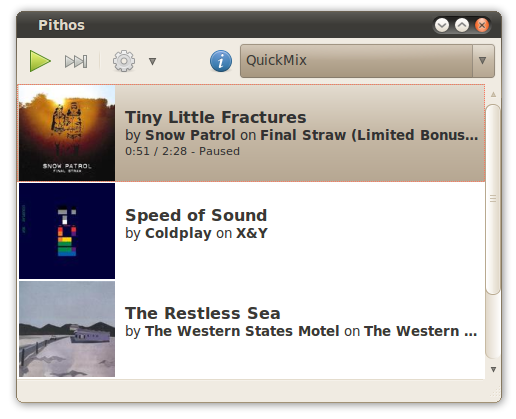 Pithos - The best Pandora client in Linux! I was thrilled to find this great little app! Seriously, I cannot applaud it enough! For many years I used the Radio Tray app in linux to listen to internet radio without having to keep a resource heavy browser window open on my little netbook. The radio tray app was great, but I have always wanted a way to listen to pandora from my tray as a native application. Simply put, Pithos is the solution to a problem you probably didn't know existed. Sort of like, you might not have known you needed antibiotics before Alexander Flemming discovered penicillin, but now you realize that it is very freaking essential! So why am I still talking right? Pithos should now show up in your applications menu! I recommend opening the Pithos settings menu and checking the box for "Show notification area icon"
This will allow you to close the application window and just use the tray icon for most functions. The main application can always be brought up from the tray and all of the normal Pandora functions can be accessed! I can really ask for nothing else, Mr. Mehall has done an excellent job and we can only hope that the service is not shutdown by Pandora anytime soon. Because the client does not show ads, the author of the application and myself recommend that you sign up for a Pandora One account. This ensures that Pandora still gets revenue and the service is more likely to work well into the future. I also recommend that you donate to Kevin Mehall for his excellent work! I know that this is a blog for very, very poor computer geeks who don't have a penny to spare, but I'm sure that anything you donate will be appreciated.